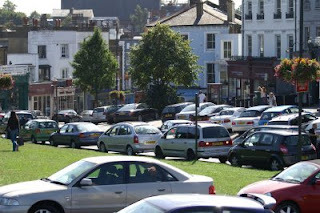 Local news about all things Blackheath, Greenwich, Lewisham and around. Buenos Aires Cafe is without doubt the best restaurant in the village - I haven't eaten in all of them - yet - but I have tried most - and this place has been outstanding on every visit. The menu is mostly steak, although it does oddly also do pizza and pasta. The wine list is fantastic too, I usually get them to recommend one and they are always spot on. Starters are lovely little parcels of pastry filled with meat or vegetables called empanadas or spicy homemade sausages called chorizo. I would recommend going for the 400gr steaks - if there's any left they will happily give you a doggy bag for it. Price wise I think it's excellent value for money, two people can have a starter, main, and bottle of wine for under £100, depending on what you order of course. It might seem expensive but I think when you look at some of the "chain" restaurants in the village and what they charge you can end up paying £60-70 for what is essentially a re-heated ready meal. The only very minor downside is you nearly always have to book, but that's a reflection of it's popularity. And besides eating out should be a treat - not something you do everyday - unless of course you go to Zin which is a whole different story. Oh and you'll love the photo's on the wall, taken by the owner back in the day when he was a working as a Paparazzi. In case you haven't been able to take a peek outside today, you won't have missed the whitest, snowiest, coldest day EVER (well for the last 18 years apparently). I was up at 7, and straight onto the heath and in the park to snap some wonderful pictures! As to be expected there were alot of people with similar ideas - some trying to get to work (crazy), some trying out home made sledges down the hill (nutters), and a few that were trying to recreate the slopes of Val D'Isere in South East London (posers). I snapped them all and have got them here for your delectation! I am very pleased to see some new businesses taking root in our lovely Blackheath Standard. For all you hairy monkeys (and I do include myself in that group - although I'm more of a squirrel - ahem) there is now some serious choice when it comes to de-fuzzing those tanned and bronzed limbs. 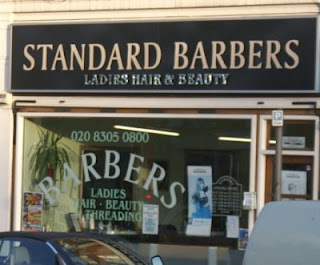 I was commenting to a friend about a new place that has opened called "Standard Barbers" now the name really is deceptive and from the outside you would be right in assuming it is a Barbers or hairdressers... but if you venture inside there are some little rooms assigned for the sole purpose of waxing and threading. They offer the usual waxing options, and they do a nifty bit of threading too. What I like are the prices - which I think very reasonable. Sadly they have no website so I have scanned in a copy of the price list at the end of the blog. I thought it would be a good idea to compare the prices so I have a link to the BBrown website, this is the tanning salon near M&S, which also offers waxing and threading. What I will mention is that the prices on the website are nothing like the prices I was told when I visited in person - so I would call and check before making any appointments. 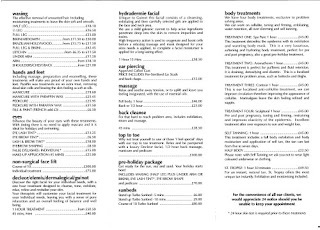 Just to be fair I have also included one other place in the village which also has a huge selection of beauty treatments, Good Looks are just a short walk from the station. 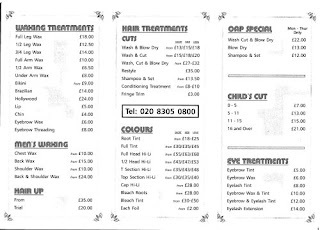 Of course if you commute via Greenwich then you may prefer the Greenwich Clipper which also have a comprehensive list of treatments, I couldn't find a website for them so I've scanned in a price lis, see below. 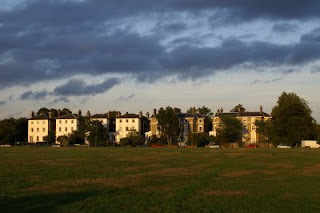 As promised I have put together some links and information to the current discussions going on about the London Olympic 2012, and what that means for Greenwich Park which is currently planned to host the equestrian events. My initial reaction when I read the first snippets of information was outrage - how DARE they close the park, destroy the trees and probably make lots of squirrels homeless in the process. But on closer inspection it's not really that straight forward, well to start with the level of information available is miserable. Well let me re-phrase - the level of "official" information is miserable. There are alot of articles speculating on the level of disruption and on what they may do - but as yet nothing from the illustrious London Organising Committee for the Olympic Games (LOCOG). That in itself is a worry... again my first thought was "Oh well it's not so bad because they are only at the planning stage, and as yet nothing is agreed" but then it got me thinking would they do anything without our say so? Would they? Well, Yes I think they would - they have already - we were definitely not consulted in the decision to use the park in the first place. I am almost certain that there are still many people who are unaware. So I started googling to see what there was out there about some of the other olympic areas in London, how well informed were the local residents there? Who are this LOCOG? What is the Olympics all about anyway. 1. Their primary objective is to host the games and anything else is secondary or of no relevance... that is to say on the day the Games start everything had better be just perfect, it had better be the best Party the world has seen because no excuse is going to work if it goes t*ts up... You won't be hearing any one up in front of Lord Coe saying... "Sorry sir but we didn't think we should spend that extra million on stables because of the residents... sir" No that ain't gonna happen. 2. Who is responsible after the Games? Well surprisingly LOCOG's responsibilities end as soon as the Games do... so do you really think they are going to be bothered about what happens after? I don't think so. 3. There are already plenty of articles and information available online that demonstrate their intention to bulldoze over any consultations. One on the Guardian. 4. From the reports I have read so far, it would seem that most Olympics never make money, local business suffers, and the residents of the area either leave or lock themselves away for the whole thing! 5. 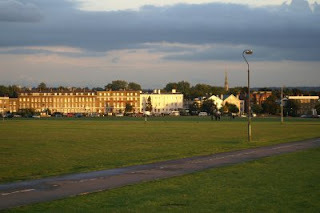 There is no doubt that it won't only be Greenwich Park involved, I'm sure there are plans to use Blackheath as well. Thai Food, Drag Race and alot of rain! I haven't exactly been very good at keeping this up to date, so this is a bit of mish mash from the last month. How many of you heard about the Thai Food Festival on the 10th and 11th of August? Well I don't think it was very well advertised. Still the squirrels were out and about and ready for some yummy food, even though it poured down on the Saturday. I did a bit of googling after and found these links - so if you want to find out what's happening on your doorstep check these out: get a pdf here on the royal parks website "What's on in the Park" and you can check the events page for Greenwich park here. Overall I thought the food was OK, some more exceptional than others - notably the Blue Elephant which was to be expected if you've ever visited their restaurant in Fulham you'll be familiar with their excellent reputation. There was no sign of the Blackheath Thai restaurant Laicram, thank goodness - I have to say I we ate there recently and it was awful (raw chicken satay!) Was it a bad night or is this the norm? Well judging from the reviews on London Eating I'd say it's not worth the risk. On a more colourful note we bumped into the Metro Annual Drag Race at Greenwich on 16th August, also another event which apparently happens every year and I hadn't a clue. I think it's for charity, and the race starts in the Rose & Crown and finishes outside the Greenwich Bar and Grill. Obviously we can't register for this years race but if you don't want to miss next year's then keep a look out on the Metro Centre's website. 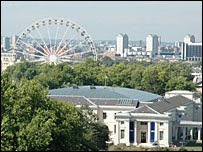 Next post is going to be about the hotly debated Greenwich Park and Olympics - with lots of links to information on line. As my first post I'd like to add a number of photo's from around the area. 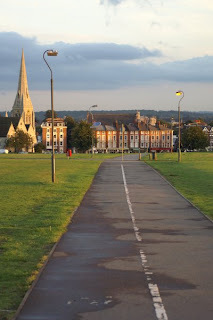 I have lived in Blackheath for nearly 4 years now, and can honestly say it is one of the best kept secrets in London. Stunning views of London, wonderful quaint village, amazing open spaces, lots of little squirrels ....... but shhhhh we don't want anyone else moving in.